35mm projection booth at Market Square Cinema, Madison, Wisconsin; 10 May 2013. When exactly did film end? According to the mass-market press, here are some terminal dates. July 2011: Technicolor closes its Los Angeles laboratory. October 2011: Panavision, Aaton, and Arri all announce that they will stop manufacturing film cameras. January 2012: Eastman Kodak files for bankruptcy protection. March 2013: Fuji stops selling negative and positive film stock for 35mm photography. Each of these events looked like turning points, but now they seem merely phases within a gradual shift. After all, the digital conversion of cinema has been in the works for about fifteen years. The key events–the formation of a studio consortium to set standards, the cooperation of technical agencies and professional associations, the lobbying for 3D by top-money directors–didn’t get as much coverage. Because so many maneuvers took place behind the scenes and unfolded slowly, digital cinema seemed very distant to me. To understand the whole process, I had to do some research. Only in hindsight did the quiet buildups and sudden jolts form a pattern. On the production end, it seems likely that filmmakers will continue to migrate to digital formats at a moderate pace. Proponents of 35mm are fond of pointing out that six of 2012’s Oscar-nominated pictures were shot wholly or partly on film. (To which you might well respond, Who cares about Oscar nominations? I would agree with you.) Yet even 35mm adherent Wally Pfister, DP for Christopher Nolan, admits that within ten years he will probably be shooting digital. What about the other wings of the film industry, distribution and exhibition? Put aside distribution for a moment. Digital exhibition was the central focus of the blog series that became my e-book Pandora’s Digital Box. There I try to trace the historical process that led up to the big changes of 2009-early 2012. Today, a year after Pandora’s publication, everybody knows that 35mm exhibition of recent releases is almost completely finished. But let’s explore things in a little more detail, including poking at some nuts and bolts. As we go, I’ll link to the original blog entries. 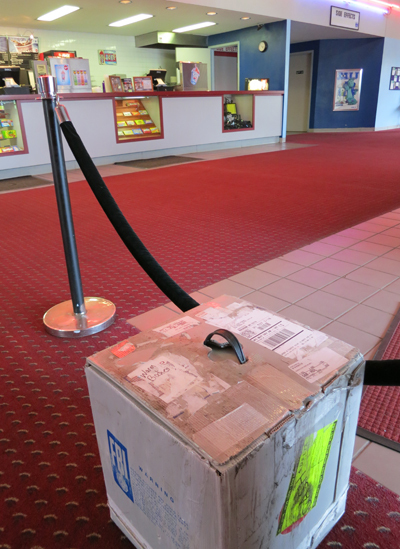 35mm print of Warm Bodies about to be shipped out from Market Square Cinemas, Madison, Wisconsin; 10 May 2013. The overall situation couldn’t be plainer. At the end of 2012, reports David Hancock of IHS Screen Digest, there were nearly 130,000 screens in the world. Of these, over two-thirds were digital, and a little over half of those were 3D-capable. Northern European countries have committed heavily to the new format. The Netherlands, Denmark, and Norway are fully digital, while the UK is at 93% saturation and France is at 92%. Both national and EU funds have helped fund the switchover. Hancock reports that in Asia, Japanese screens are 88% digital, and South Korean ones are 100%. China is the growth engine. Rising living standards and swelling attendance have triggered a building frenzy. Over 85%, or 21,407 screens are already digital, and on average, each day adds at least eight new screens. In the US and Canada, there were at end 2012 still over 6400 commercial analog screens, or about 15% of the nearly 43,000 total. My home town, Madison, Wisconsin, has a surprising number of these anachronisms. One multiplex retains at least two first-run 35mm screens. Five second-run screens at our Market Square multiplex have no digital equipment. That venue ran excellent 2D prints of Life of Pi (held over for seven weeks) and The Hobbit: An Unexpected Journey. It’s currently screening many recent releases, including the incessantly and mysteriously popular Argo. In addition, our campus has several active 35mm venues (Cinematheque, Chazen Museum, Marquee). Our department shows a fair amount of 35mm for our courses as well; the last screening I dropped in on was The Quiet Man in the very nice UCLA restoration. Unquestionably, however, 35mm is doomed as a commercial format. Formerly, a tentpole release might have required 3000-5000 film prints; now a few hundred are shipped. Our Market Square house sometimes gets prints bearing single-digit ID numbers. Jack Foley of Focus Features estimates that only about 5 % of the copies of a wide US release will be in 35mm. A narrower release might go somewhat higher, since art houses have been slower to transition to digital. Focus Features’ The Place Beyond the Pines was released on 1442 screens, only 105 (7%) of which employed 35mm. In light of the rapid takeup of digital projection, Foley expects that most studios will stop supplying 35mm copies by the end of this year. David Hancock has suggested that by the end of 2015, there won’t be any new theatrical releases on 35mm. 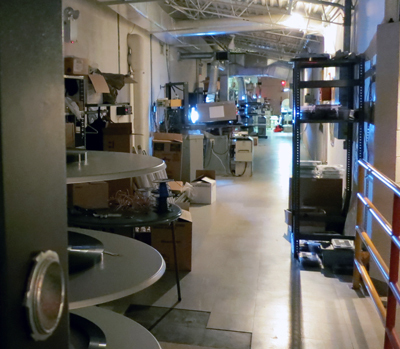 Correspondingly, projectionists are vanishing. In Madison, Hal Theisen, my guide to digital operation in Chapter 4 of Pandora, has been dismissed. The films in that theatre are now set up by an assistant manager. Hal was the last full-time projectionist in town. The conversion to DCI standards was costly, running up to $100,000 per screen. Many exhibitors took advantage of the Virtual Print Fee, a subsidy from the distributors that paid into a third-party account every time the venue booked a film from the Majors. There were strings attached to the VPF. The deals are still protected by nondisclosure agreements, but terms have included demands that exhibitors remove all 35mm machines from the venue, show a certain number of the Majors’ films, equip some houses for 3D, and/or sign up for Network Operations Centers that would monitor the shows. The biggest North American chains are Regal, AMC, and Cinemark. They control about 16,500 screens and own fifty-three of the sixty top-grossing US venues. The Big Three benefited considerably from the conversion. By forming the consortium Digital Cinema Solutions, they were able to negotiate Wall Street financing for their chains’ digital upgrade. They also formed National Cinemedia, a company that supplied FirstLook, a preshow assembly of promos for TV shows and music. Under the new name of NCM Network, the parent company now links 19,000 screens for advertising purposes. NCM also supplies alternative content to over 700 screens under the Fathom brand: sports, musical acts, the Metropolitan Opera, London’s National Theatre, and other items that try to perk up multiplex business in the middle of the week. The digital conversion has coincided with—some would say, led to—a greater consolidation of US theatre chains. Last year the Texas-based Rave circuit was dissolved, and 483 of its screens, all digital, were picked up by Cinemark. More recently, the Regal chain gained over 500 screens by acquiring Hollywood Theatres. The biggest move took place in May 2012 when the AMC circuit was bought for $2.6 billion by Dalian Wanda Group, a Chinese real estate firm. Combined with Wanda’s 750 mainland screens, this acquisition created what may be the biggest cinema chain in the world. Wanda has declared its intent to invest half a billion dollars in upgrading AMC houses. Meanwhile, vertical integration is emerging. In 2011, Regal and AMC founded Open Road Films, a distribution company. It has handled such high-profile titles as The Grey, Killer Elite, End of Watch, Side Effects, and The Host. Cinedigm, which began life as a third-party aggregator to handle VPFs, has moved into distribution too, billing itself as a company merging theatrical and home release strategies tailored to each project. It has become evident that the digital revolution in exhibition permits American studio cinema a new level of conquest and control. Distribution, we’ve long known, is the seat of power in nearly all types of cinema. Whatever the virtues of YouTube, Vimeo, and other personal-movie exhibition platforms, film’s long-standing public dimension, the gathering of people who surrender their attention to a shared experience in real time, is still largely governed by what Hollywood studios put into their pipeline. View of Madagascar from the Sky-Vu Drive-In, 2012. Photo by Duke Goetz. While the Big Three grew stronger, what became of smaller fry? John Fithian of NATO suggested that any cinema with fewer than ten screens could probably not afford the changeover, and David Hancock suggested that up to 2000 screens might be lost. Recent speculation is that drive-ins will be especially hard hit. Pandora’s Digital Box, as blog and then book, surveyed those most at risk: the small local cinemas and the art houses. I fretted about the loss of small-town theatres, not least because I grew up with them. Data on such local venues are hard to get, so for the blog and the book I went reportorial and visited two Midwestern towns. The blogs related to them are here and here. The long-lived Goetz theatres in Monroe, Wisconsin, consist of a downtown triplex and the Sky-Vu drive-in. They’re run by Robert “Duke” Goetz, whose grandfather built the movie house back in 1931. Duke is a confirmed techie and showman. He designs and cuts ads and music videos to fill out his show, and he personally converted all his screens to 7.1 sound. So it’s no surprise that he’s a fan of digital cinema. But back in December his digital upgrade took place during the worst box-office weekend since 2008–a bad omen, if you believe in omens. I can move movies from screen to screen in short order or download from the Theatre Management System to any and all theatres at one time, so when the weather is damn cold, for Monday -Thursday screening I’ll play the shorter movies in the biggest house. . . . I am now able to start the movies from the box office with software that accesses the TMS, so it’s just like being at the projector. It saves my guys time and keeps them where the action is. Contrary to trends elsewhere, the Sky-Vu has benefited strongly from digital display. Duke’s was the first North American drive-in to sign up for the NEC digital system. People comment on how the bright, sharp image has improved their experience. 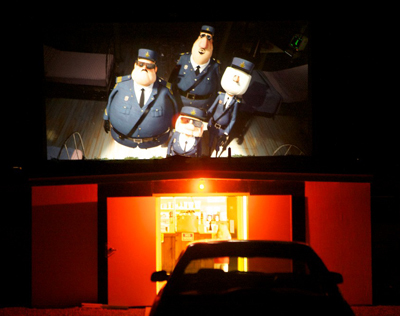 The drive-in had “a tremendous summer,” with the first Saturday night of Brave, coupled with Avengers, proving to be the best night of the year. Measured by both box office returns and number of admissions, that show did better than Transformers the summer before. Last fall, when the Sky-Vu was the only area drive-in still open, some patrons traveled 2 1/2 hours from Illinois. The only problem with digital under the stars was that Duke couldn’t get a satisfactory VPF deal for an outdoor cinema because he doesn’t run it year-round. While Duke runs the Goetz theatres as a family business, the JEM Theatre in Harmony, Minnesota is more of a sideline for its owner-operator Michelle Haugerud. 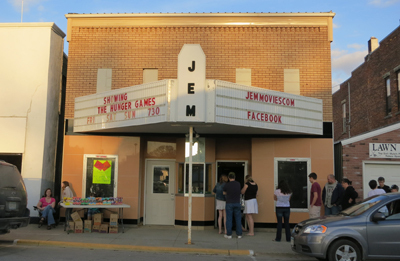 A single screen running only at 7:30 on weekend nights, the JEM plays a unifying role in the life of the town. But it’s a small market. Harmony consists of only 1020 people (many of them Amish), and the median household income is about $30,000. Michelle had to finance the conversion through donations and bank assistance. The task was complicated by the unexpected death of her husband Paul, who ran the JEM with her. Michelle reports that the digital conversion hasn’t increased business. Box office was about the same in 2012 as in 2011, and so far this year ticket sales have been down. It has been a slow winter and spring throughout the industry, and people are hoping the summer blockbusters will lift revenues. But the JEM faces particular problems that the Goetz doesn’t. Michelle and her family run the JEM as much for the community as for themselves. She is hoping for better times. Converting to digital has made showing movies easier, and I have had no issues with the new equipment. However, it has not helped with ticket sales at all. I am holding on and committed to this year, but if I get to the point where it is costing me personally to stay open, I don’t think I will continue. I love having the movie theatre and would love to keep it going. I do feel if I had a say on what movies I showed and when, I would do so much better. 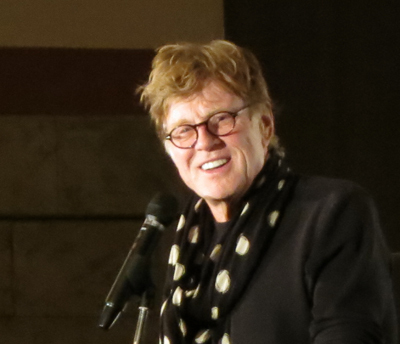 Robert Redford addresses the Art House Convergence, January 2013. Several managers and programmers of arthouse cinemas around the country have formed an informal association, the Art House Convergence. It meets once a year just before the Sundance Film Festival, which many members attend. When I visited the conference in 2012, the digital transition was the central topic. It aroused curiosity, bewilderment, frustration, and some annoyance. This year, things were different. Participants were calmly reconciled to the inevitable, and some looked forward to it. On one of the few panels that took up the subject, moderator Jan Klingelhofer of Pacific Film Resources began by asking: “How many of you are still on the fence about digital?” Just one hand was raised. On the panel, technology experts from major companies showed how new projection systems could be installed even in offbeat venues. The New Parkway in Oakland was once a garage, and the Mary D. Fisher Theatre in Sedona is a converted bank. Panelists also gave information on choices of technology, from lamps and servers to the best screen materials for 3D. The teeth-gnashing is over, and now art-house leaders are focusing on practicalities: the best strategies suited for their business models. A private, for-profit art house faces many of the problems faced by Duke Goetz and Michelle Haugerud, except that the art-house is screening films of narrower appeal. Because the audience is smaller and more select, many art houses have become not-for-profit entities created by community cultural organizations. They are dependent on donations, private or public patronage, and miscellaneous income from many activities, not only screenings but filmmaking classes, special events, and other activities. A good example of the diversity of outreach an arthouse can have is the Bryn Mawr Film Institute, whose director, the estimable Juliet Goodfriend, also coordinates the annual AHC survey. So the coordinators of the not-for-profit theatre must persuade boards of directors and generous patrons that the digital upgrade is necessary. Small venues, whether private or not-for-profit, can’t benefit much from economies of scale. A multiplex can amortize its costs across many screens, but a big proportion of art houses boasts only one or two. Add to this the fact that multiplexes are encroaching on the art-house turf with crossover films like Moonrise Kingdom and upscale entertainment like opera and plays from Fathom. Even museums are starting to install digital equipment and play arts-related programming. The chief task, of course, is paying for the upgrade. Last year’s AHC session was often about the money. Small local cinemas like the Goetz could benefit from VPF deals, but for many art houses such deals weren’t a good option. These houses don’t run enough films from the Majors to repay the subsidy. While they’re often eager to take something from Fox Searchlight, Focus Features, and the Weinstein company, they book a lot from IFC, Magnolia, and other independent distributors. A common solution was to launch fundraising campaigns from the community, much as Michelle did in Harmony. One of the biggest initiatives was that conducted by the boundlessly energetic John Toner and Chris Collier of Renew Theaters in Pennsylvania. Without going for a VPF, they raised $367,000 to pay for converting three screens (one in 3D). John and Chris are vigorous advocates for the new format, and their “This Is Digital Cinema” series treats restorations of classics like Gilda and The Ten Commandments as showcases for the DCP. At AHC 2013, John and Chris provided an entertaining PowerPoint presentation on how they managed the switchover; for a prose version, you can read John’s account here. Likewise, the Tampa Theatre raised $89,000 from its community. But what if your community can’t sustain such a big campaign? I hadn’t predicted in Pandora how powerful Kickstarter would be in the film domain, and the results are initially encouraging. Donations to the Cable Car Cinema and Cafe of Providence surpassed the goal by six thousand dollars, and the theatre is already preparing for the new equipment. The final 35mm program will be, what else?, The Last Picture Show, complete with pulled-pork sandwiches. The Crescent Theatre of Mobile won nine thousand more than it asked for, and Martin McCaffrey, venerable moving spirit of Montgomery’s Capri Theatre, followed suit and came out ahead by about the same amount. Currently the Kickstarter site lists dozens of conversion projects, and many have met their goals–with Boston’s Brattle and LA’s Cinefamily hitting over a hundred thousand dollars. The pitches are pretty creative (“The Cinefamily is a non-profit movie theater with awesome programming, but crappy everything else”) and so are the giveaways (the Skyline drive-in of Everett, Washington offers a vintage speaker box that’s “clean and suitable for presentation”). So maybe predictions were too pessimistic. Will we lose so many theatres to the switchover? Maybe not. But raising money for the initial conversion isn’t the whole story. Technology: Running in place to keep up? In the shift to digital projection, some would say the pivotal moment came with the success of Avatar and other 2009 3D releases (Monsters vs. Aliens, Ice Age: Dawn of the Dinosaurs, and Up). In 2009 there were about 7400 digital screens; a year later there were nearly 15,000. Then the acceleration began. Ten thousand screens converted in 2011 and eight thousand more the following year. But I see 2005 as another major marker. In 2004, there were only 80 digital screens in the US. By the end of 2005, there were over 1500. The early adopters were pushed by the emergence of 3D, heavily touted by several major directors at NATO’s annual convention and the strong 3D releases of The Polar Express (2004) and Chicken Little (2005). So there were two bursts of digital adoption, both driven by 3D. With 3D as a Trojan horse, digital entered exhibition. The format eventually settled on was the Digital Cinema Package, an ensemble of files gathered on a hard drive. The movie, with subtitles and alternate soundtracks, is wrapped in a thick swath of security files. The studios, petrified of piracy, had delayed the completion of digital cinema for some years until an ironclad system was protecting the movie. The DCP can be opened only with a customized key, delivered to the theatre separately from the hard drive. Typically the key is sent on a flash drive, so that the staff member need not retype the tediously long string of alphanumeric characters that make it up. Copying that key into the theatre’s server, its theatre management system, or the projector’s media block allows the film to be played on a certified projector. One way to expand the market was offered by cheaper machines. In fall of 2012, all the manufacturers introduced DCI-compliant projectors suitable for screens around thirty feet wide. The machines were still quite expensive, but they were marginally more affordable for the smaller or independent exhibitors who had been reluctant to convert or who had missed the deadlines for VPF financing. To maintain a quality difference from high-end machines, the cheaper versions typically lacked some features. They might be capable of only 2K, or they might not permit a wide range of frame rates, or they offered less brilliant illumination. Another answer to a saturated market was continuous research and development. No sooner had exhibitors installed the “Series 2” projectors introduced in late 2009-early 2010 than speculation began about enhancements. How soon, for instance, might we expect 6K or even 8K resolution? Two other innovations were responding to problems with the dimness of digital 3D images. One possibility was laser projection, which would be expected to brighten the image considerably. Laser projectors may start appearing in Imax cinemas later this year, but for most venues the current costs are prohibitive, running about half a million dollars per installation. 3D light levels could also be boosted by shooting and showing at higher frame rates than the standard 24. Peter Jackson famously experimented with 48-frame production on The Hobbit: An Unexpected Journey, and some theatres screened it that way. Response was mostly skeptical, with critics complaining of the hypersharp, “soap-opera” effect onscreen. The frame-rate issue has mostly quieted down, but it did trigger academic studies of the perceptual psychology involved in frame rates. In addition, James Cameron has insisted that his sequels to Avatar will be shot at an even higher frame rate. Most projectors require new software in order to increase frame rates. Alongside developments in the projection market have come new devices for sound. As Jeff Smith pointed out in an earlier entry, innovative sound systems have been enabled by the switchover to digital presentation. 35mm film stock constrained the amount of physical space on the film strip that auditory information could occupy. Now that sound is a matter of digital files, sound designers can add many tracks for greater immersive effects—so-called “3D audio” platforms. Barco’s Auro 11.1 system and Dolby Atmos position several more speakers around the auditorium, including ones high above the audience. Costs of installation for these systems run from $40,000 to $90,000. A digital projector is a computer that puts out light. How many computers will you go through in the next ten years? How many Series 1 projectors are still in use and supported by the manufacturers? Try buying parts for them. I know of one that was purchased four years ago that has been pushed into a corner. It has sat there for about two months so far, with no end in sight. (Thank heavens they still have their 35 mm gear!) It is broken and the manufacturer cannot supply parts; their customer service department doesn’t know about the machines, as they have only had to deal with the newer models; and the parts are not listed in their own internal parts book. Yes, four years old. When replacement parts are available, they can be exceptionally pricey. A projector’s light engine, central to the image display, can run $22,000. And if an exhibitor buys a brand-new projector some years from now, the studios aren’t likely to launch a new round of VPF financing. Many, many small, independent theatres, which are vital to the survival of non-studio films, will end up being fatally hobbled by the transition. They may be able to raise funds to cover the initial conversion, but what will crush many of them in the long term is the ongoing capital resources that will be necessary to continue to have DCI-compliant equipment in the next ten and twenty years. . . . In the same way the current inexorable pattern of planned obsolescence forces consumers to continually repurchase computers, phones, etc., cinemas too are going to find that they have to spend much more for cinema equipment over the next twenty years than they did, say, from 1980 to 2000. . . . So these technological progressions will make it harder for those small theatres to survive. The problem is acute for small and art-house venues, but it isn’t minor for the Big Three either. Unless film attendance jumps spectacularly (it has been more or less flat for several years), exhibitors may need to raise ticket prices and the costs of concessions. This strategy may work in urban areas but won’t be popular elsewhere. Moreover, part of the boom in box-office revenues during recent years has been due to the upcharge for 3D features. But in the US, 3D revenues are currently leveling off at about $1.8 billion, a drop from the format’s 2010 peak of $2.14 billion. In 2012, 3D’s market share slipped as well. It isn’t clear that people would flock to 3D if the images were brighter. And if 3D television takes off, stereoscopic cinema will seem less compelling as a novelty. Some observers hold out hope for glasses-free 3D technology in theatres, a change that would probably boost business. But the difficulties of creating 3D of this sort for multiplex venues are immense. The glasses-free platforms proposed by Dolby are aimed at small displays, like TVs, smartphones, and tablets. Of course, if 3D without glasses were devised for big screens, it would almost certainly demand yet another projector redesign. When it comes to distribution, digital isn’t there yet. The UPS and Fed Ex corps still bring movies to multiplexes the old-fashioned way. The little briefcases are a lot lighter than hulking metal shipping cases, but we’re still dealing with physical artifacts. At least for the moment. Festival submissions are already being placed in Cloud-based lockers like Withoutabox in an effort to replace DVD screeners. Online delivery is already being used for many of those operas, ballets, and other forms of “alternative content” flowing onto screens from various suppliers. A Norwegian distributor sent a 100 gigabyte local film, fully encrypted, to forty cinemas in the spring of 2012. This and experiments in other countries employ fiber-based networks, but the Digital Cinema Distribution Coalition, a joint venture among Hollywood studios and the Big Three exhibition chains, is exploring satellite systems. In the Pandora book, I included chapters on other exhibition domains I haven’t revisited here. Take archives. More and more studios refuse to rent prints, will not prepare DCPs of most classic titles, and won’t let theatres screen Blu-ray discs commercially. So repertory cinemas turn to archives, seeking to rent 35mm copies that may be irreplaceable. In addition, archivists, laboring under tight budget constraints, are racing to preserve and restore their material on film, which remains the most stable support medium. At the same time, archives are expected to get involved in preparing high-quality digital versions of popular classics. Henceforth most restorations that you see will be circulated on 2K or 4K, as Metropolis, La Grande Illusion, and Les Enfants du Paradis have been in recent years. Film festivals, as Mike King, one of our Wisconsin Film Festival programmers observes, are now file festivals. Cameron Bailey reported that of the 362 titles screened at TIFF last year, only fifty-one were on film. Last month, our annual event ran twenty-one new films on film; most were 16mm experimental items. The remaining 132 were on DCP, HDCam, Quicktime files, or DVD/Blu-ray. On the plus side, independent filmmakers are learning to encode their films in the DCI-compliant format, often without layers of security, so at least in this respect technology may not be a severe barrier to entry. As for me, I’m still in the midst of churn. I watch movies on film, on DCP, on DVD and Blu-ray and VOD, even on laserdisc, and sometimes on my iPad. But my research will miss 16mm and 35mm. Some of the questions I like to ask can be answered only by handling film. Last weekend I sat down at a Steenbeck flatbed and counted frames in passages of Notorious and King Hu’s Dragon Inn. This sort of scrutiny is virtually impossible on DVDs and Blu-rays, which don’t preserve original film frames. What I’ve lost as a specialist is offset by many gains. Since the arrival of Betamax and VHS, nontheatrical cinema has expanded to limits we couldn’t have imagined in the 1970s. Thanks to consumer digital formats, more people have more access to more movies of all sorts than at any point in history. Although some aspects of film-originated movies are hard to recover on digital playback, we can study cinema craft to an extent that wasn’t possible before. Digitization has allowed sophisticated visual and sonic analysis to bloom on websites around the world. See, among many examples, Jim Emerson’s Scanners and A. D. Jameson’s work on Big Other. With the rise of nontheatrical consumption, though, what’s most at risk is theatrical cinema: film viewing as a public forum. Exhibition outside film festivals is already starting to narrow to recent releases and a few approved classics. We will be able to watch The Suspended Step of the Stork and Leviathan on our home screens for a long time to come, but very seldom on the scale that benefits them most. As ever, the problem of technology isn’t only a matter of hardware. Technology develops within institutions. Hollywood has standardized a new technology favoring its goals. The institutions of minority film culture–festivals, art houses, archives, local cinemas, schools–need to be robust and resourceful to maintain all the types of cinema we have known, and the types we might yet discover. Since Pandora was published, a very comprehensive guide to the mechanics of digital projection has appeared: Torkell Saætervadet’s FIAF Digital Projection Guide, and it’s a must. One rich treatise I didn’t cite in Pandora is Hans Keining’s 2008 report 4K+ Systems: Theory Basics for Motion Picture Imaging. Michael Karagosian’s website is an excellent general source on digital exhibition in the late 2000s. 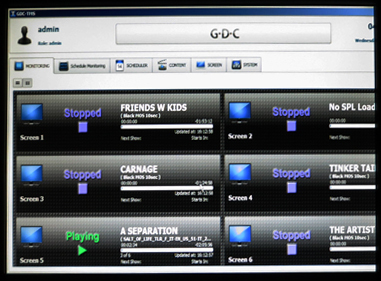 Screen Daily provides a good overview of the new technology on display at CinemaCon 2013. For general background on industry trends after the changeover, see the Variety article “Filmmakers Lament Extinction of Film Prints.” As for archives, Nicola Mazzanti edited a very useful European Commission study, Challenges of the Digital Era for Film Heritage Institutions (Berlin/ UK, 2012). May Haduong surveys current problems of print access and film archives in “Out of Print: The Changing Landscape of Print Accessibility for Repertory Programming,” The Moving Image (Fall 2012), 148-161. The piece requires online library access, but a summary is here. Much of the industry information in this entry came from proprietary reports published in IHS Screen Digest. Thanks to David Hancock for his assistance with other data, and to Patrick Corcoran of NATO for updated information on theatre conversion. Thanks as well to Chapin Cutler, Duke Goetz, Michelle Haugerud, and Dylan Skolnick for permission to quote them. I’m also grateful to Jack Foley of Focus Features and Joshua Hittesdorf of Market Square Cinemas. Finally, I want to thank Russ Collins and his colleagues at the Art House Convergence for mounting another splendid event and for inviting me back last January. I continue to learn from the discussions on the AHC listserv, and I’m particularly grateful to John Toner for his reports on independent cinemas’ funding efforts. Other entries on this site offer material on the digital transition. There’s “It’s good to be the King of the World,” on James Cameron’s push for 3D TV; “ADD = Analog, digital, dreaming,” about the powers of photochemical cinema on display at the Toronto International Film Festival 2012; “Digital projection, there and here,” some notes on the situation in Western Europe; and “Side by side: Quick catchups,” includes notes on sources for studying digital cinema. In “16, still super,” veteran programmers talk about how they continue to rely on this format; in the process they convey their commitment to providing unusual fare. P. S. 15 May 2013: Rebecca Hall of the extraordinary Northwest Chicago Film Society has posted a continually updated list of theatres that are dedicated to showing films in 16mm and 35mm. P.P.S. 12 June: David Hancock has just presented a very full report entitled “Digital Cinema Worldwide: 35mm phased out in many countries, though some lag behind.” It is published in the June IHS Screen Digest. One of my remarks above has been corrected in light of some information in the report: I claimed that Belgium has fully converted, but David’s figures indicate 96.5% conversion. David predicts that by end 2013, 90 % of world screens will be digital. Even India is making the move, as circuits relying on DVD or other low-resolution sources are converting to DCI-compatible equipment. Those regions slowest to convert include Italy, Greece, and Spain (not surprisingly, given recent austerity policies), as well as areas of South America and the Pacific (e.g., Thailand, the Philippines). Thanks to David and his team at IHS Screen Digest for their comprehensive coverage of this process. Dragon Inn (King Hu, 1967). 35mm frame enlargement, taken on Fujichrome 64. This entry was posted on Sunday | May 12, 2013 at 7:43 pm	and is filed under Digital cinema, Film technique: Sound, Global film industry, Hollywood: The business, Movie theatres, New media: Technology, PANDORA'S DIGITAL BOX: The Blog Series, Readers' Favorite Entries. Responses are currently closed, but you can trackback from your own site.